Jack Taylor/Getty ImagesPolice officers near the scene where the former double agent Sergei Skripal and his daughter were discovered poisoned. The Trump administration is planning to impose targeted sanctions on Russia over the March poisoning of the former spy Sergei Skripal and his daughter on British soil. The sanctions will target exports of US national security equipment and products to Russia. Sergei and Yulia Skripal were poisoned by the powerful nerve agent Novichok, a type of poison developed in the Soviet Union during the 1980s, but Russia has denied any involvement. The Trump administration is planning to impose targeted sanctions on Russia over the March poisoning of the former spy Sergei Skripal and his daughter on British soil, the US State Department said Wednesday. The new sanctions are scheduled to take effect August 22 after a 15-day congressional notification period. Sergei and Yulia Skripal were found collapsed in Salisbury, England, in early March. 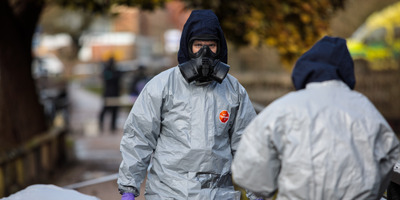 Medical examinations determined they had been poisoned by the powerful nerve agent Novichok, a poison developed in the Soviet Union during the 1980s. The US concurred with other nations including the UK, France, and Germany in determining it was “highly likely” that Russia was behind the poisoning. The Kremlin has consistently denied those allegations and offered a series of contradictory explanations as to who was responsible. The sanctions will reportedly be structured in two parts, according to NBC News. The US will impose restrictions on exports and financing and will block licenses that would allow powerful national security and military equipment and technology to be exported to Russia. If Russia does not supply the US with “reliable assurances” it will not use chemical weapons in the future and does not consent to allowing UN inspectors into the country, the US could hit Russia with second wave of more serious sanctions, according to NBC News, which cited a State Department official. The second round could include more limits on trade, deep cuts to diplomatic relations, and restrictions on Russia’s state airline being allowed in US airspace. The US already decreased the number of Russian diplomats in the country when it followed the UK’s lead by expelling dozens of Russian envoys it said were spies earlier this year.